Are you in need of Houston TX birthday party ideas for girls? Then it’s about time you heard of Rock Star Spa Bus! 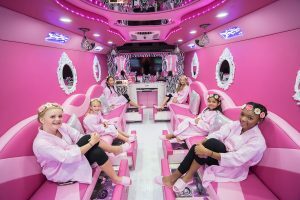 Rock Star Spa Bus is a luxury party service during which your children can receive manicures and pedicures with their friends. They can also watch music videos, get cool accessories and clothes, and have facials done. There is so much to do when your girls are on our bus! Don’t worry about traffic. We park the bus at your location of choice. This way, you can keep an eye on your kids while they have the time of their lives in your front yard. Your girls will be treated to all sorts of luxury pampering and fun accessories while socializing with their friends. This experience will be truly unforgettable for your little princess. We know you want to see our busses for yourself, and we will get to that shortly. In this article, we will tell you about our available packages, services, and how you can party like a rock star! The bus itself is pink and starry on the outside. If your little girl saw this driving down the street, no doubt she would want to ride in it. In the picture above, you can see as the guests make a red-carpet entrance so that they feel like celebrities. All the attention will surely make your birthday angel glow with pride. The excitement only increases when they get inside. The spa bus is spectacularly designed. Even you might feel like a princess as you look at it. Everything is pink! Due to limited space, parents are not allowed on the bus during spa services. One host parent is allowed to supervise. We are the only Spa Bus that has a custom whirlpool spa pedicure in Texas. Our pedicure spa base is equipped with pipeless whirlpool, handcrafted fiberglass base with Stainless steel foot bath, Shower sprayer, single handle for hot & cold water faucet and color therapy LED light. Our manis and pedis are specially tailored for young girls. We do not use any sharp metal instruments as an adult spa does but offer all of the traditional spa processes of foot soak, salt glow polish, file, massage, polish, and nails design. Our Spa Pedicures are the most exquisite of all mobile spa parties in Houston. Imagine how much fun your girls could have if you bought them one of our wonderful packages! For your convenience, we have compiled a list of all available party packages for the Rock Star Spa Bus with pricing. Keep in mind that when you go above the recommended guest count, each guest will cost $30 more. Our service primarily focuses on girls, but we have packages that will make it fun for boys too. 1 hour 45 minutes of Spa/Party Time for up to 10 girls, Red Carpet Rockstar Entrance, Mini Mani/Pedi and more! 1 hour 45 minutes of Spa/Party Time for up to 10 girls, Red Carpet Rockstar Entrance, Mini Mani/Pedi, Energizing Iced Cucumber facial and more! Party props for girls AND boys! Glow sticks, Glow Necklace, Glow Bracelets, Glow make up for girls & more! The perfect party for ages 4-8 years old! Royal Glamour makeup, princess hair accessories, glitter, robes, and more! The perfect party for moms and daughters! Robe for mommy and daughter to use! Glitter Tattoo for the Birthday Girl and more! There are some steps to take before you are ready to party like a rock star. All you need to do is designate a space (such as a parking lot or driveway). We may ask for access to electricity and running water. If your guests want their nails painted, it is suggested they remove all nail polish beforehand. If you need to cancel, you need to contact us with 72 hours notice. Otherwise, you may be forfeiting your deposit. In the case of bad weather, we will either return your full deposit or make alternate arrangements for your convenience. We don’t want to let you down! It is important for us to establish a loyal customer base, so let us know if there is anything we can do for you. You can bring your own music, though it is unneeded. The party guests will have full access to a karaoke system, CD/DVD players, AUX ports, and up to date sound systems. We also have the internet so we can watch YouTube and Vevo karaoke and sing-along videos. If you would like to purchase a gift certificate towards a package, whether you are a relative or friend, you can do it in $100 denominations! Here’s to the most memorable party to your future rockstar! RockStar Spa Bus specializes in girlie spa celebrations. Our spa bus is specially designed for young girls and offers an awesome setting to get pampered and party. 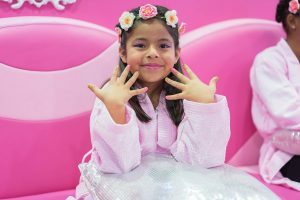 Our little girl’s spa parties feature manicures and pedicures, mini facials, hairstyles and makeup, robes, a swank runway entrance, karaoke, dress up and more! We offer the most luxurious spa bus experience for girls, an excellent kids party idea in the Houston area! Visit here to purchase a gift certificate. There are several ways to contact Rock Star Spa Bus. You can fill out the form located here with your information and message. One of us will get back to you as soon as possible. Alternatively, you can call 1-844-GIRL-SPA or 1-844-447-5772. This phone line is available Monday through Saturday, from 10 am to 8 pm. On Sundays, you can call between 11 am and 7 pm. Now you have the best Birthday Party Ideas For Girls Houston TX! !